These light waves carry energy. This energy can do many interesting things, like help grow a plant, produce electric currents, or cause chemical reactions. Light carries a different amount of energy depending on its wavelength. Light that has a longer wavelength appears more red, and light that has a shorter wavelength appears blue. 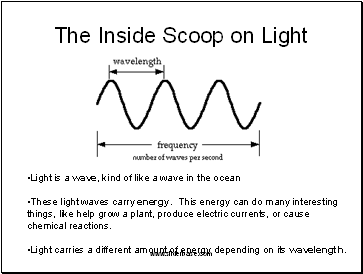 The shorter the wavelength, the higher the energy carried by the wave. You may have heard of “ultraviolet” or “infrared” light. That is light at either extreme of wavelength, very short (ultraviolet) or very long (infrared). 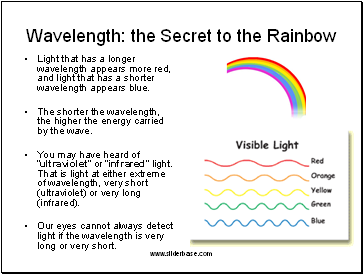 Our eyes cannot always detect light if the wavelength is very long or very short. A wave is bent when it hits a rough surface or passes through a small opening, or aperture. This is called diffraction. 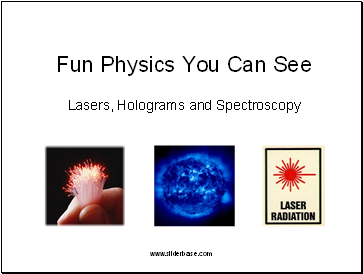 Diffraction happens to all types of waves, including light. The white light we see from the sun and light bulbs is not really white. It is made up of many different colors. These colors that make up the light are known as a spectrum. If you have ever seen a rainbow, then you have seen the visible spectrum. 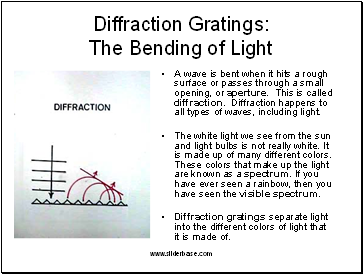 Diffraction gratings separate light into the different colors of light that it is made of. Electrons in an atom can get excited. An excited electron is in a state of high energy. Sometimes these electrons jump down to a state with low energy. The difference in energy is given off as light. Since different kinds of light have slightly different spectra, scientists can use a star's spectrum to figure out what elements it is made of. 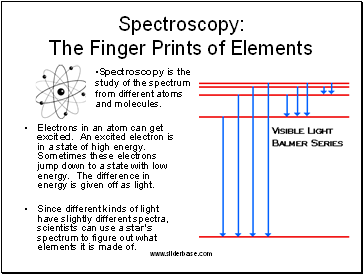 Spectroscopy is the study of the spectrum from different atoms and molecules. 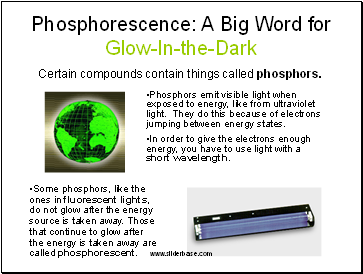 Certain compounds contain things called phosphors. Phosphors emit visible light when exposed to energy, like from ultraviolet light. They do this because of electrons jumping between energy states. In order to give the electrons enough energy, you have to use light with a short wavelength. Some phosphors, like the ones in fluorescent lights, do not glow after the energy source is taken away. Those that continue to glow after the energy is taken away are called phosphorescent.